We’re exploring Thai cuisine’s influences in ski towns across beautiful Colorado. First up, the majestical town of Telluride and its local Thai outpost, Siam. Let’s meet the team. Tuna fish doesn’t have to be plain or boring. Watch Chef Chuck turn tuna fish into a healthy and delightful treat! Chef Chuck Valla takes us through his Tom Yum Quinoa recipe. 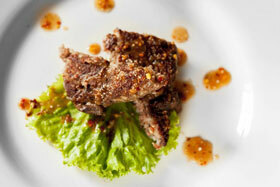 Thaithentic Recipes is an ongoing series of delicious Thai dishes created in real kitchens using fresh ingredients. Thaithentic is proud to introduce you to “The Thai-In,” a web series focused on travel, food, people, and how Thai food and culture tie-in to all of it. We will be exploring local foods and customs across the globe, while focusing on local eats and customs.